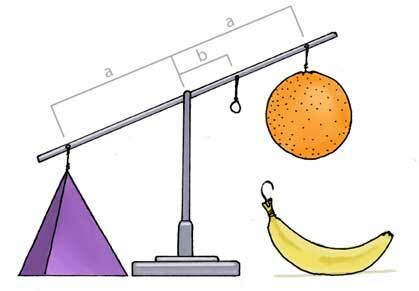 During the construction of a new installation, a surrealist has to balance a purple pyramid (mp = 0.4 kg) with an orange (mo = 0.3 kg) and a banana (mb = 0.2 kg). If the pyramid and the orange are both located a distance a = 0.2 m from the pivot point, calculate where the banana should be located (i.e. find b). A drawing that Rebecca Langer created to illustrate a statics problem Alastair created for his first year class.